Star – Delta Transformer Yd) (Grounding Transformer). Scott (“T” Type) Transformer (Grounding Transformer). In Primary Winding Each Phase is120°electrical degrees out of phase with the other two phases. In Secondary Winding Each Phase is120°electrical degrees out of phase with the other two phases. Each primary winding is magnetically linked to one secondary winding through a common core leg. Sets of windings that are magnetically linked are drawn parallel to each other in the vector diagram. In the Y-Y connection, each primary and secondary winding is connected to a neutral point. The neutral point may or may not be brought out to an external physical connection and the neutral may or may not be grounded. Transformer magnetizing currents are not purely sinusoidal, even if the exciting voltages are sinusoidal. The magnetizing currents have significant quantities of odd-harmonic components. If three identical transformers are connected to each phase and are excited by 60 Hz voltages of equal magnitude, the 60 Hz fundamental components of the exciting currents cancel out each other at the neutral. This is because the 60 Hz fundamental currents of A, B, and C phase are 120° out of phase with one another and the vector sum of these currents is zero. The third, ninth, fifteenth and other so-called zero-sequence harmonic currents are in phase with each other; therefore, these components do not cancel out each other at the neutral but add in phase with one another to produce a zero-sequence neutral current, provided there is a path for the neutral current to flow. Due to the nonlinear shape of the B-H curve, odd-harmonic magnetizing currents are required to support sinusoidal induced voltages. If some of the magnetizing current harmonics are not present, then the induced voltages cannot be sinusoidal. Figure Show the situation where the primary neutral is returned to the voltage source in a four-wire three-phase circuit. Each of the magnetizing currents labeled IR, IY, and IB contain the 60 Hz fundamental current and all of the odd harmonic currents necessary to support sinusoidal induced voltages. The zero-sequence magnetizing currents combine to form the neutral current IN, which returns these odd harmonics to the voltage source. Assuming that the primary voltage is sinusoidal, the induced voltages VR , VY , and VB (in both the primary and secondary) are sinusoidal as well. The connection of primary neutral to the neutral of generator has an add advantage that it eliminates distortion in the secondary phase voltages. If the flux in the core has sinusoidal waveform then it will give sinusoidal waveform for the voltage. But due to characteristic of iron, a sinusoidal waveform of flux requires a third harmonic component in the exciting current. As the frequency of this component is thrice the frequency of circuit at any given constant. It will try to flow either towards or away from the neutral point in the transformer windings. With isolated neutral, the triple frequency current cannot flow so the flux in the core will not be a sine wave and the voltages are distorted. If primary neutral is connected to generator neutral the triple frequency currents get the path to solve the difficulty. The alternative way of overcoming with this difficulty is the use of tertiary winding of low KVA rating. These windings are connected in delta and provide a circuit in which triple frequency currents can flow. Thus sinusoidal voltage on primary will give sinusoidal voltage on secondary side. This situation changes if the neutrals of both sets of the primary and secondary windings are not grounded. 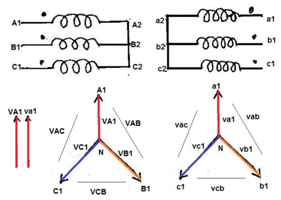 Y-Y Connection without Grounded Neutral: If the neutrals of both the primary and the secondary are open-circuited and so there is no path for the zero-sequence harmonic currents to flow and the induced voltages will not be sinusoidal. V’R, V’Y, and V’B will not be sinusoidal. This results in distortions of the secondary voltages. The resulting voltage distortion is equivalent to a Y-Y transformer with zero-sequence currents allowed to flow in the primary neutral with an imaginary superimposed primary winding carrying only the zero-sequence currents 180° out of phase with the normal zero-sequence currents. Analysis of the voltages induced by the ‘‘primary windings’’ is greatly complicated by the fact that the core is highly nonlinear so that each of the individual zero-sequence harmonics currents carried by the phantom primary windings will induce even higher-order harmonic voltages as well. Fourier analysis can be used to arrive at an approximation of the secondary voltages with an open primary neutral. Taking one phase at a time, the normal magnetizing current for a sinusoidal exciting voltage is plotted from the B-H curve of the transformer. The normal magnetizing current is converted to a Fourier series and then it is reconstructed by removing all of the zero-sequence harmonics. The resulting exciting current will have a shape different from the normal exciting current, which is then used to construct an induced voltage using the B-H curve in there verse manner that was used to construct the original exciting current. This process is rather laborious, so suffice it to say that if a Y-Y transformer does not have a neutral path for zero-sequence exciting currents, there will be harmonic voltages induced in the secondary even if the exciting voltage is purely sinusoidal. 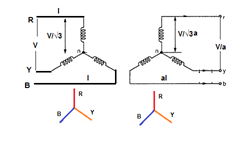 No Phase Displacement: The primary and secondary circuits are in phase; i.e., there are no phase angle displacements introduced by the Y-Y connection. This is an important advantage when transformers are used to interconnect systems of different voltages in a cascading manner. For example, suppose there are four systems operating at 800, 440, 220, and 66 kV that need to be interconnected. Substations can be constructed using Y-Y transformer connections to interconnect any two of these voltages. The 800 kV systems can be tied with the 66 kV systems through a single 800 to 66 kV transformation or through a series of cascading transformations at 440,220 and 66 kV. Required Few Turns for winding: Due to star connection, phase voltages is (1/√3) times the line voltage. Hence less number of turns is required. Also the stress on insulation is less. This makes the connection economical for small high voltage purposes. Required Less Insulation Level: If the neutral end of a Y-connected winding is grounded, then there is an opportunity to use reduced levels of insulation at the neutral end of the winding. A winding that is connected across the phases requires full insulation throughout the winding. Handle Heavy Load: Due to star connection, phase current is same as line current. Hence windings have to carry high currents. This makes cross section of the windings high. Thus the windings are mechanically strong and windings can bear heavy loads and short circuit current. Use for Three phases Four Wires System:As neutral is available, suitable for three phases four wire system. Eliminate Distortion in Secondary Phase Voltage: The connection of primary neutral to the neutral of generator eliminates distortion in the secondary phase voltages by giving path to triple frequency currents toward to generator. Sinusoidal voltage on secondary side: Neutral give path to flow Triple frequency current to flow Generator side thus sinusoidal voltage on primary will give sinusoidal voltage on secondary side. Used as Auto Transformer: A Y-Y transformer may be constructed as an autotransformer, with the possibility of great cost savings compared to the two-winding transformer construction. Better Protective Relaying: The protective relay settings will be protecting better on the line to ground faults when the Y-Y transformer connections with solidly grounded neutrals are applied. The Third harmonic issue: The voltages in any phase of a Y-Y transformer are 1200 apart from the voltages in any other phase. However, the third-harmonic components of each phase will be in phase with each other. Nonlinearities in the transformer core always lead to generation of third harmonic. These components will add up resulting in large (can be even larger than the fundamental component) third harmonic component. Overvoltage at Lighting Load: The presence of third (and other zero-sequence) harmonics at an ungrounded neutral can cause overvoltage conditions at light load. When constructing a Y-Y transformer using single-phase transformers connected in a bank, the measured line-to-neutral voltages are not 57.7% of the system phase-to-phase voltage at no load but are about 68% and diminish very rapidly as the bank is loaded. The effective values of voltages at different frequencies combine by taking the square root of the sum of the voltages squared. With sinusoidal phase-to-phase voltage, the third-harmonic component of the phase-to-neutral voltage is about 60%. Voltage drop at Unbalance Load: There can be a large voltage drop for unbalanced phase-to-neutral loads. This is caused by the fact that phase-to-phase loads cause a voltage drop through the leakage reactance of the transformer whereas phase-to-neutral loads cause a voltage drop through the magnetizing reactance, which is 100 to 1000 times larger than the leakage reactance. Overheated Transformer Tank: Under certain circumstances, a Y-Y connected three-phase trans- can produce severe tank overheating that can quickly destroy the transformer. This usually occurs with an open phase on the primary circuit and load on the secondary. Neutral Shifting: If the load on the secondary side unbalanced then the performance of this connection is not satisfactory then the shifting of neutral point is possible. To prevent this, star point of the primary is required to be connected to the star point of the generator. Distortion of Secondary voltage: Even though the star or neutral point of the primary is earthed, the third harmonic present in the alternator voltage may appear on the secondary side. This causes distortion in the secondary phase voltages. Over Voltage at Light Load: The presence of third (and other zero-sequence) harmonics at an ungrounded neutral can cause overvoltage conditions at light load. Difficulty in coordination of Ground Protection: In Y-Y Transformer, a low-side ground fault causes primary ground fault current, making coordination more difficult. Increase Healthy Phase Voltage under Phase to ground Fault: If a phase-to-ground fault occurs on the primary circuit with the primary neutral grounded, then the phase-to-neutral voltage on the UN faulted phase’s increases to 173% of the normal voltage. If the neutrals of the primary and secondary are both brought out, then a phase-to-ground fault on the secondary circuit causes neutral fault current to flow in the primary circuit. Trip the T/C in Line-Ground Fault: All harmonics will propagate through the transformer, zero-sequence current path is continuous through the transformer, one line-to-ground fault will trip the transformer. Suitable for Core Type Transformer: The third harmonic voltage and current is absent in such type of connection with three phase wire system. or shell type of three phase units, the third harmonic phase voltage may be high. This type of connection is more suitable for core type transformers. This Type of Transformer is rarely used due to problems with unbalanced loads. It is economical for small high voltage transformers as the number of turns per phase and the amount of insulation required is less. Calculate % Voltage Regulation of Small Distribution Line. Calculate % Voltage drop of Individual Load. Calculate % Voltage drop of Various ACSR, AAAC, AAC conductor overhead Line. Calculate Receiving end Voltage of Distribution Line.